Observers cite that the timing of the Libya embassy attack and the uproar resulting from the anti-Islamic video ‘Innocence of Muslims’ was strategic to an ideal ‘false flag’ operation. Senator Dianne Feinstein (R-Calif.), Chair of the Senate Intelligence Committee, has a closed oversight hearing scheduled for November 15. The committee will make inquiries into security lapses during the attack on the US embassy in Benghazi that facilitated the death of US Ambassador to Libya Christopher Stevens, who was killed along with three staff members on the eleventh anniversary of September 11, 2001. The hearing will be the second investigation to ascertain why security measures in Benghazi failed on the night of the attacks, despite numerous warnings received by the State Department from Ambassador Stevens that outlined recent violence in Libya and subsequent safety concerns. As emerged in a similar inquiry in October, that of the National Security Subcommittee, the ambassador sent numerous cables after a string of terrorist attacks against civilian targets in Libya created what he felt to be “a security vacuum” in the country. CBS Newsreported that hours after the professionally-coordinated assault began, an unmanned Predator drone was sent over the US mission in Benghazi, and that the drone and other reconnaissance aircraft simply observed the final hours of the protracted battle. Why? While the others were killed earlier on, the last two Americans didn’t die until close to the end of the seven-hour attack. State Department Regional Security Officer Eric Nordstrom, commented during the October inquiry that the extra security requested in Libya prior to the attack would not have been enough to withstand the hit. “Having an extra foot of wall, or an extra half-dozen guards or agents would not have enabled us to respond to that kind of assault,” he said. The ferocity and intensity of the attack was nothing that we had seen in Libya, or that I had seen in my time in the Diplomatic Security Service” of 14 years. Sufficient reinforcements did eventually arrive, and the attack ended. Still, given the facts, it is unlikely the two most important questions will ever be answered: If the intelligence, technology, coordination and weaponry to put the attack beyond “ordinary revolutionaries,” who were they? Why was security in Benghazi effectively a stand down? There is one question whose answer is clear. The reason why the attack took place the same day as the targeting of Muslim audiences with the unspeakable video clip, Innocence of Muslims, was to horribly, falsely depict the Holy Last Messenger (peace be upon him); and with the ensuing false flag, to paint Muslims as bloodthirsty heathens. Like 9/11, this fatal incident, indeed, has every marking of a false flag operation: a high-profile act of seemingly senseless violence that harbors hidden intentions to generate false propaganda thereby driving false beliefs and/or war. As usual, American blood is expendable. It was George Bush Sr. who was the chosen “light bearer”, who on September 11, 1990 at 9:09 PM gave his famous “Toward a New World Order speech”. He continued to introduce more of our esoteric terms in several more speeches. “Global” was one of these words. It soon replaced the word, “world”. He spoke of a “new world order”. He mentioned “a thousand points of light”. Other terms that soon became mainstream are “masses”, “implement” (as “implement” A New World Order, “implement” The Plan) and “usher in”. Eleven years later to the day, on September 11, 2001, the organization pulls off the “attack on America”, which created many opportunities for the organization in their push for the final steps of the completion of their plan for that NWO. NOTE THE DATES AND TIMES and see the progression. Also, keep in mind how many times the numbers 1, 9 and 11 are used and how often September 11th is used. 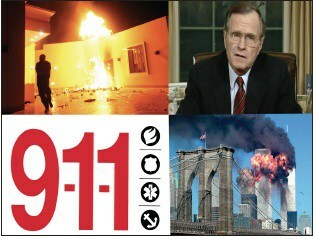 The numbers 9 and 11 are favorite numbers in the organization, and September 11th is a favorite date for the organization.